WIN A WILL SPIN SPIN WHEEL YO-YO. 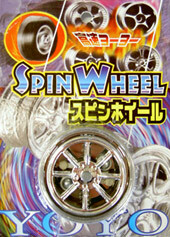 To celebrate the New Year at willspin.com we are giving away a very exclusive Will Spin, Spin Wheel Yo-Yo! It's an awesome yo-yo and perfect for all kinds of tricks due to the very special bearings that power this chromed plastic monster! The bearings are said to be sourced from rare metals that have fallen from space which give the Yo-yo it's anti gravity effect. As used (to maintain their dextrous skills) by Will Spin, MC Grinder and DJ 8 Noize. 2. Post a reply to the Competition topic here. The winner will be selected at random at an undisclosed time before Feb 1st 2006, so get moving!